Hello and happy Thursday everyone!!! Today I am sharing an art journal page I created for Sassy Scrappers using Lindy’s Stamp Gang Magical Shakers and Dylusions Paints. Make sure you check out the video at the end of the blog!! 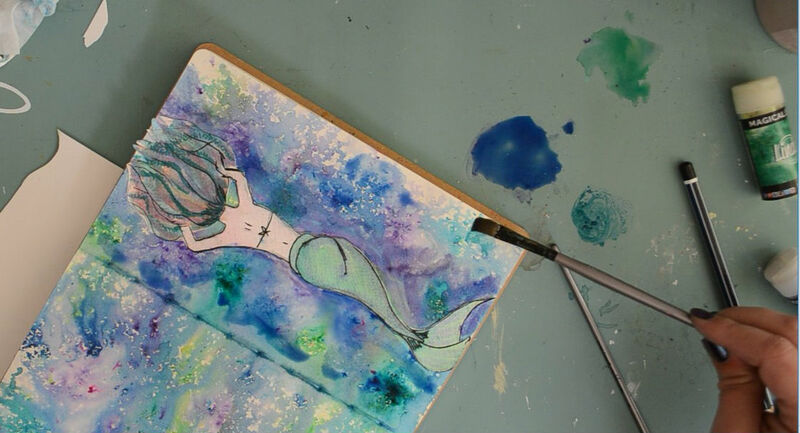 When I started my page, I wasn’t sure what I wanted to do but after using the magical shakers for my background I decided to do an under water theme….. I’m not much of an artist when it comes to drawing and this was my first time drawing a mermaid (will definitely need to to practice some more lol) she isn’t perfect but I wanted to show some different techniques when using the shakers. So to build the background I used Polka Purple, Guten Tag Teal, Lederhosen Laurel and Bavarian Blue. 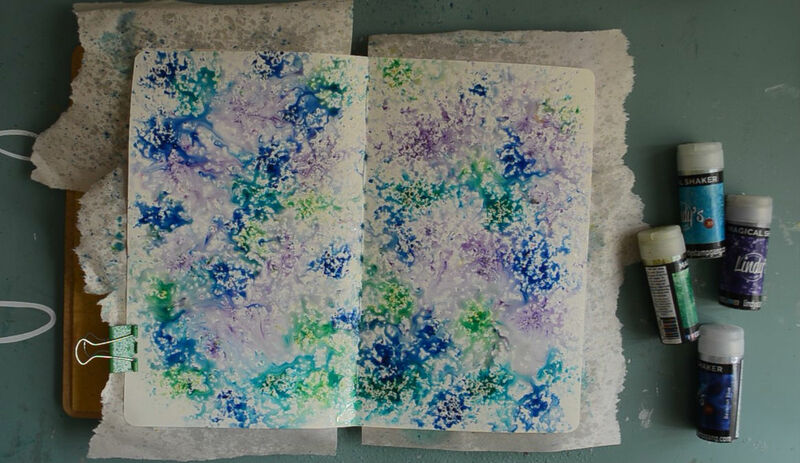 I sprinkled randomly onto my page and spritz with water. I did use a heat gun to dry but if you have the time, let it air dry as the results are amazing. 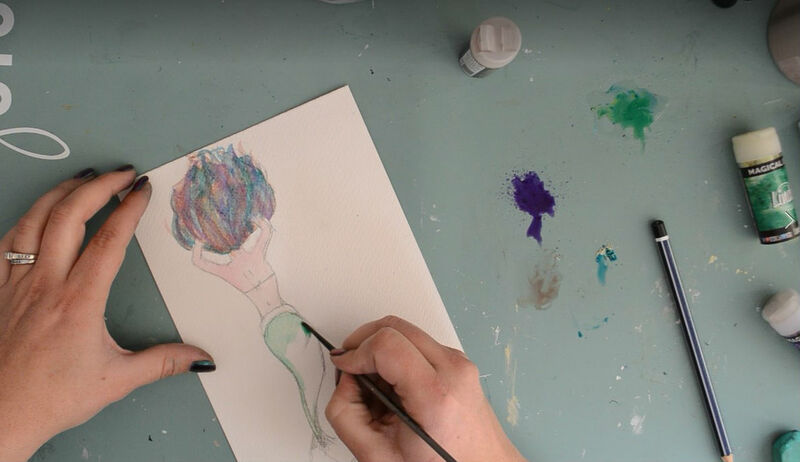 I then drew my mermaid onto some watercolour paper and used the above magical shakers plus Bratwust Brown and Oom Pah Pah Pink to colour in my mermaid and adhered her to my page. I then decided that I wanted to do a bit more to the background so using a wet paint brush I played a little more with the shakers until I was happy. Next I used Dylusions Paint Dirty Martini and Fresh Lime to paint some seaweed and used a paint pen to draw some weeds. Then I mixed a small amount of water to White Linen to splatter onto the background. To finish off the page I added some sparkle using a glitter glue – you can use Ranger Diamond Stickles and just like that my page was finished. Thanks for dropping by and I hope I have inspired you to create something special!!! 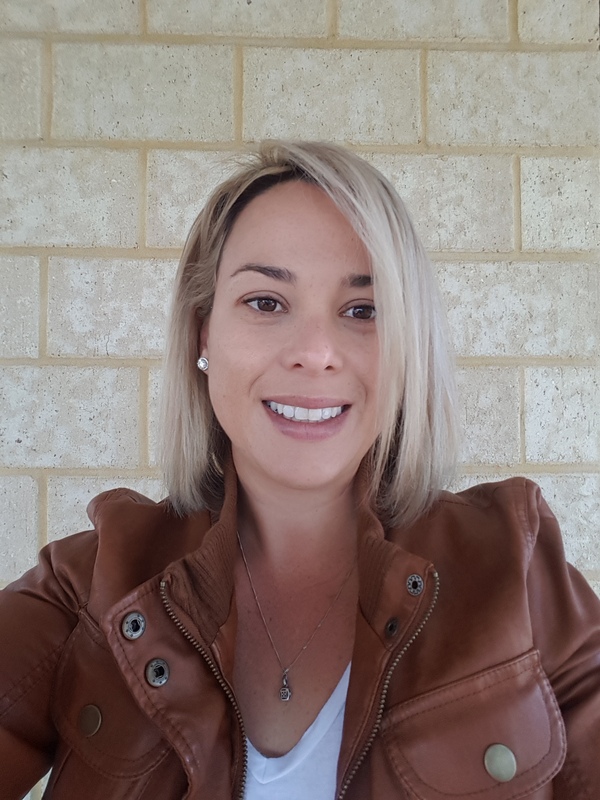 Hello Again!! Today I am sharing with you a canvas board I created using the Dusty Attic August Mood Board which is on their blog as inspiration. It’s always a challenge for me to create something that isn’t boy related due to having 3 boys so I found this a challenge but loved every moment of it. I wanted to create a canvas focusing on the dream catcher image and the colour tones….and this is what I came up with. There are so many layers to this canvas..I just love it!! And I got to use some molds a very dear friend of mine made for me. I loved how the crackle varnish created more texture to the dream catcher. Thanks for dropping by and hopefully this has inspired you to create using the Dusty Attic Mood Board. I am super excited to be sharing with you all my first creation using some amazing stencils and TCW mixed media products. 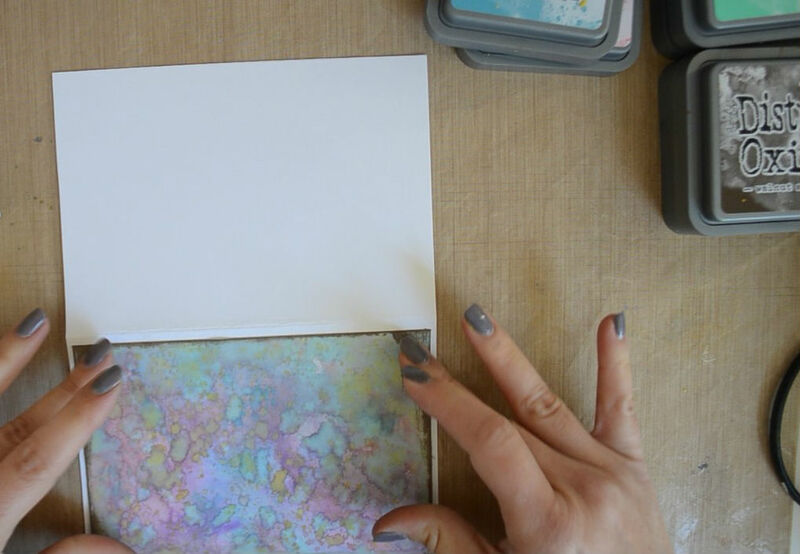 There is also a process video at the end of the blog if you would like to see how I created my art journal page. I started by building my background, I stamped onto some tissue paper using black archival ink and the Darkroom Door stamp – Measuring Tape, then adhered to my page using TCW9011 Clear Matte Gel Medium. Once it was dry, I then blended Heavy Body Paints in TCW9017 Lemon Custard, TCW9018 Orange Slice and TCW9020 Raspberry Sorbet using a make up sponge I bought from one of my local cheap shops. These paints are such a dream to use and dry very quickly which is always a positive!! Next I used the TCW735 6×6 Lacy Tiles stencil and TCW9016 Spun Sugar Heavy Body Paint. I did originally want to only use parts of the stencil but I ended up falling in love with this design and decided to fill in the gaps with the stencil. Once the background was dry, I then used TCW9009 Black Modeling Paste to stencil through the TCW726 6×6 Onion Blossoms stencil. This paste is amazing!!! It’s so thick and but not too heavy on the page. To finish off the page I added some lines on the onion blossoms using a white paint pen and added a title using some stickers. 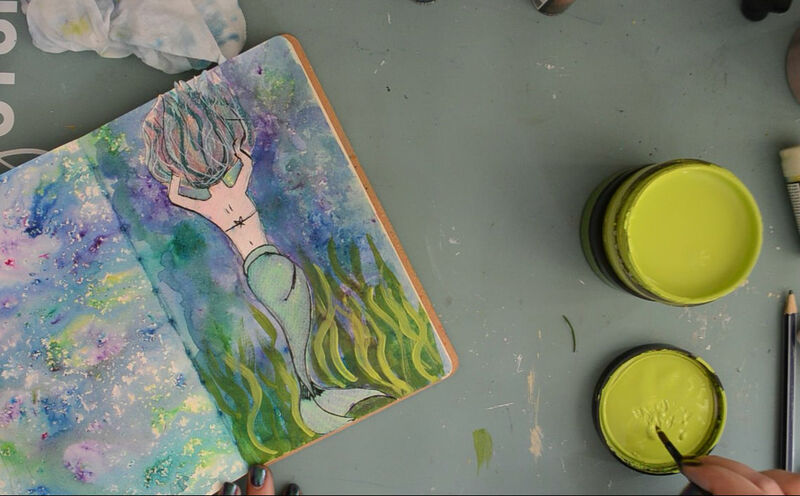 Thanks for dropping by and I hope this has inspired you to create something special in your art journal. 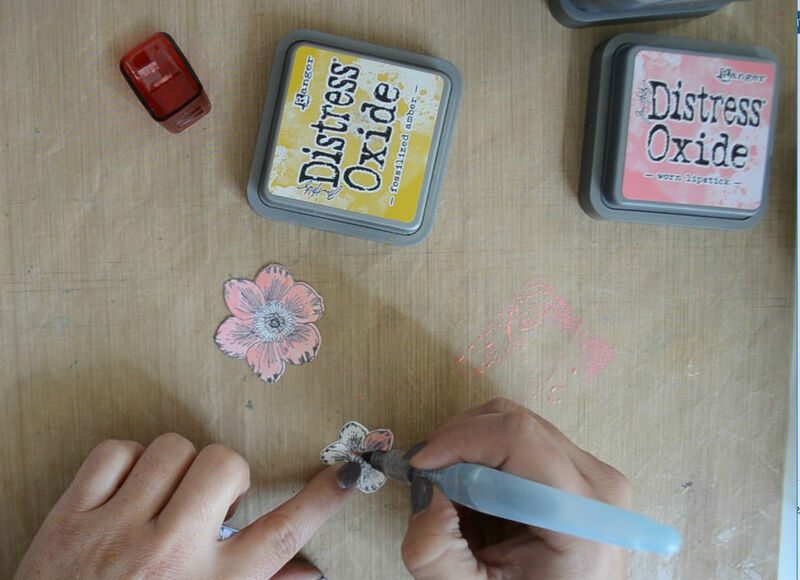 Thanks for dropping by until next time – Stay Crafty!!! 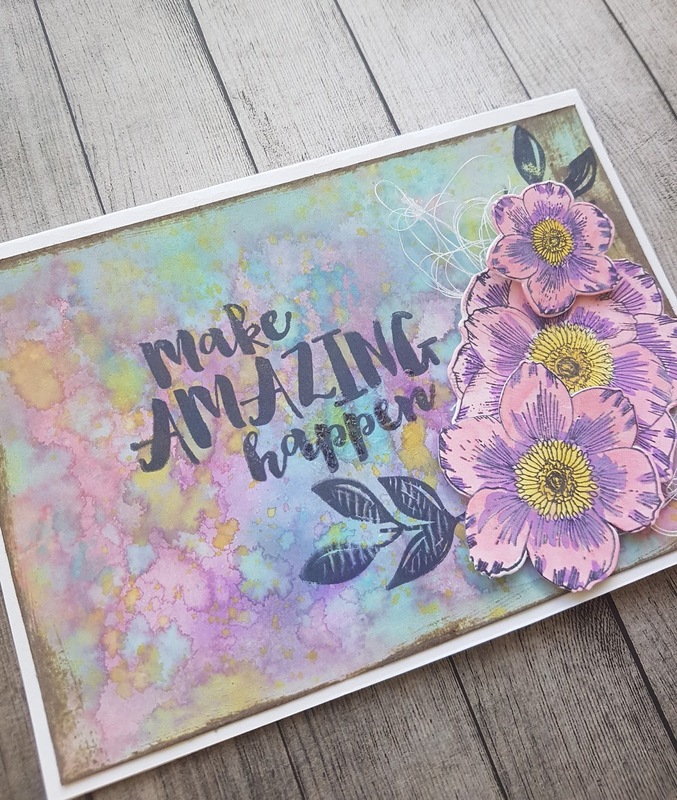 I am back to share with you all a card I made for a very dear friend of mine featuring my all time favourite ink pads….Distress Oxides!! There is a process video which you can watch also. This is what I created, I don’t do cards very often but after making this I may have to start creating them again as I had so much fun. For the background I started off by inking my craft mat with Distress Oxides – Worn Lipstick, Wilted Violet, Cracked Pistachio and Broken China. 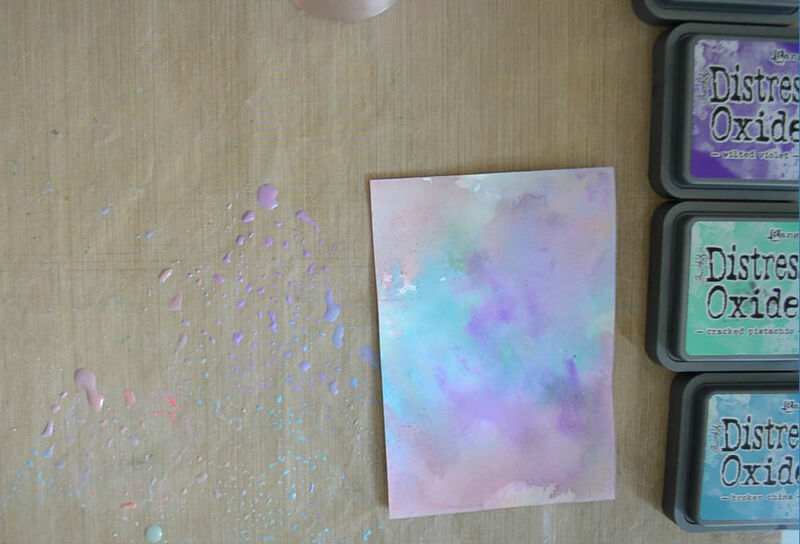 I sprayed them with some water and using the dabbing technique, I gently dabbed my cardstock onto the colours until I was happy. I splattered some Fossilized Amber Distress Oxide using a paint brush and then inked around the edges using Walnut Stain Distress Oxide. My next step was to create the flowers and I used my mini black archival ink and Vicki Boutin’s Floral stamp and die set. Then using my water pen, I painted the flowers using Worn Lipstick, Wilted Violet and Fossilized Amber. The sentiment and leaves stamp set is created by Richard Garay – Make Amazing Happen and I used my mini black archival ink for stamping. Then to finish it off I added some white thread and mounted my flowers using foam tape.